Author: Peter Edelsten, Chiku Lijongwa. Series edited by: Bernd Heine, Wilhelm J.G. Möhlig. 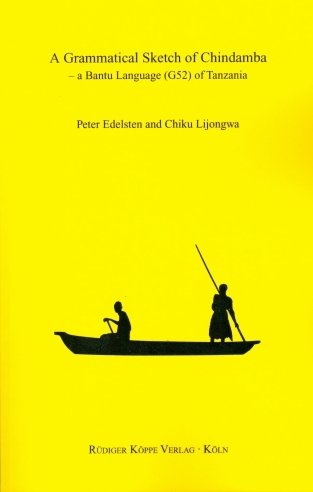 This book is a summary of the grammar of Chindamba, the language of the Ndamba people. Chindamba is a Bantu language spoken in the Kilombero valley, south of Ifakara, in Morogoro region, Tanzania. It is classified as G.52 by Guthrie (1967–71). Chindamba is spoken by approx. 55,000 people. Chiku Lijongwa is a native speaker of Chindamba and interested in preserving the language and its traditions. Peter Edelsten has studied Swahili at the renowned School of Oriental and African Studies (SOAS) at the University of London and became interested in the idea of extending the study to Chindamba. However, no previous documentation on Chindamba grammar has been found by the authors. Therefore, they decided to collaborate to document the grammar with additional inputs from other respondents in Tanzania. The fact that the language is in danger of disappearing due to the dominance of Swahili was an additional motivation for this work. The book comprises seven chapters on phonological processes, nominal and verbal morphology, predicate argument and clause structure as well as short texts collected in the field followed by a word list which was compiled as the study progressed.